Windows Chess was inspired by the arch-shaped front window of a house in my neighbourhood. It occurred to me that a game resembling both orthodox FIDE chess and circular chess could be played on a board resembling that window. 1. The ROOK moves in orbits around the loops, as well as on north-south orthogonal lines. 2. The BISHOP has its traditional moves on the 48-square grid, but on the 16 â€œpolarâ€ cells (the trapezes), it takes on interesting properties. Each trapeze acts as a pivot which swivels the bishopâ€™s move. There are also four paths, passing through the polar cells into the main grid, which unbind the bishop, allowing it to move from cells of one colour to the other. 3. The KNIGHTâ€™s move is unchanged, except in the polar regions. Twisting through the trapezes bends the three steps of a knightâ€™s move, sometimes allowing it to move to an adjacent cell. 4. There is no castling or en passent capturing. 5. 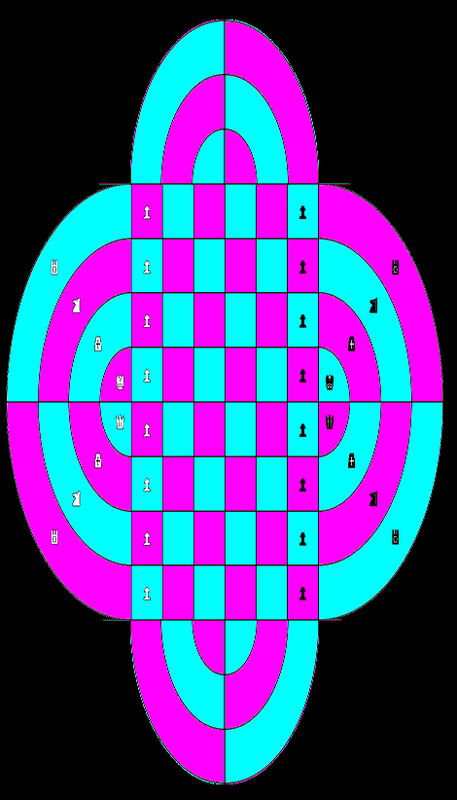 On reaching a cell occupied by an enemy non-pawn piece, pawns promote to CONQUEROR, a Queen-Knight compound, which exists only as a promotion piece. 6. Win by checkmating the opponent. Stalemate and baring the King also count as a qualified win, better than a draw but not as good as a checkmate. One point for a checkmate, half a point to each player for a draw, and half a point to one player for forcing a stalemate or baring the opponentâ€™s King.